Dennis Howard’s new home packs value on several fronts, one of which happens to be in the back: a verdant view of Sedgefield Country Club’s golf course, home of this month’s Wyndham Championship, a home-stretch tourney for PGA players who are trying to amass enough points to qualify for the upcoming FedExCup playoffs. Howard, a commercial builder and passionate duffer, moved to the new home last summer, just before the Wyndham teed off. He didn’t unpack in time to entertain, but this year, he plans to invite friends and family to check out his new digs — and the waves of golfers and galleries washing through the first green and second tee, a segue bracketed by his panoramic view. Howard lives here thanks to his late wife and college sweetheart, Cynthia, who died in 2015. A couple of years before that, she told him about a golf-course lot that was for sale on Gaston Road about 2 miles from where they lived on Old Onslow Road, overlooking Hole 14. Cynthia, a real estate agent, was eager to buy the lot on the first hole. Howard, who builds office-warehouse spaces, snapped up the lot and held it while he devoted himself to caring for Cynthia, who was fighting cancer. He regrets nothing about their final years together. After Cynthia passed, Howard decided to build on the vacant lot and sell the two-story home they’d shared for 28 of their 48 years together. He took his longtime friend, architect Carl Myatt, to lunch and told him about the lot. After lunch, they toured the site, which slopes sharply to the street. Howard wanted his house to sit on the high side, not only for the golf-course view, but also to avoid the creek at the base of the hill. He wanted the home to be one-story so he could age without worrying about stairs. He wanted all doors to be wide enough to accommodate a wheelchair. He wanted four bedrooms, enough space for his four grandchildren to visit. He wanted a three-car garage with room for a golf cart (read: grandchild taxi). He wanted a home office. He wanted an open, airy design with 10-foot ceilings and 8-foot doors scaled to the ceiling. He wanted energy efficiency. Above all, he wanted to showcase the prize view and create plenty of inviting spots to watch golfers and nature. Myatt obliged by drawing a plan that maximizes the vantage point and minimizes the energy costs. “It’s probably the best home for energy control that I’ve ever done,” says Myatt. The bricks-and-mortar result, built by D. Stone Builders, is a 3,400-square-foot model of comfort, utility and scenic oomph. The heart of the U-shaped home parallels the golf course, with views from every vital room: The master suite; the great room, which is topped with a tongue-in-groove fir ceiling; the cozy den, which is linked to the great room by a see-through fireplace; and a vanilla-hued kitchen decked with chocolate-chip granite. A russet streak in the granite flows like a river across the island and countertops. 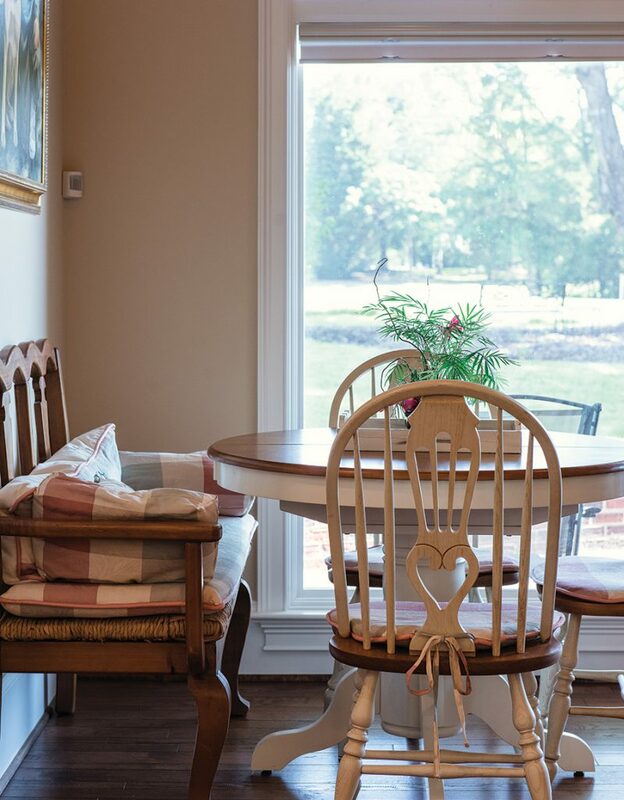 A screened porch off the kitchen allows for bug-free dining and leads to an open porch hemmed by a knee wall. 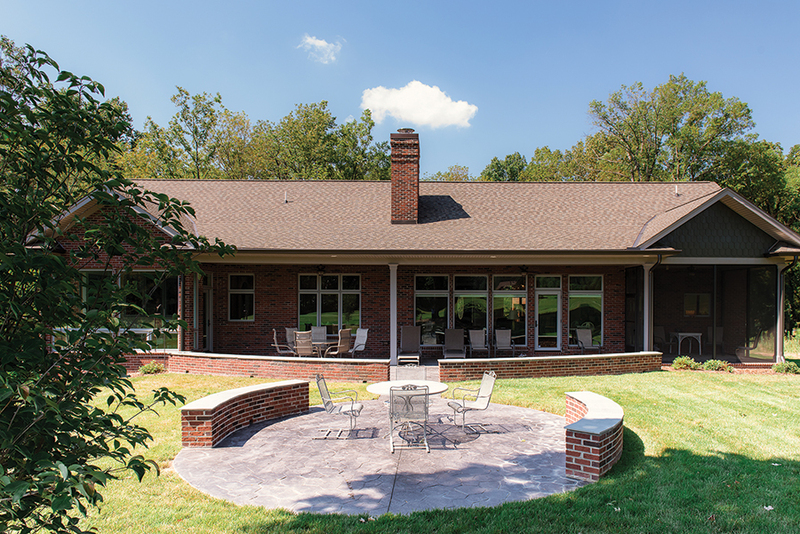 Teresa Garrett, a designer for builder Stone, helped Howard with myriad cosmetic decisions. She picked the cabinets and hardware, as well as the granites and tiles, including the iridescent tile that was used to create a waterfall wall in the glass-enclosed master shower. More glass wraps a sun porch off the master suite — “It’s a good place to watch it rain, too,” Howard says. The bedroom also sprouts a home office with a golf-course view; Myatt fit the office into a narrow space by using kitchen-style cabinets and countertops to maximize the work surface and storage. “It’s well laid-out, thanks to Carl,” says Howard. Myatt also heeded his client’s wishes by creating an easy flow of traffic and sight lines in the long axis of the house. “If you’re in the kitchen, you’re able to look in the great room, through the fireplace and into the den. You can see the master-suite door, and you can see who’s coming and going through the front door,” says Myatt. He tucked a guest room against the main corridor so visitors would wade into the flow instantly. 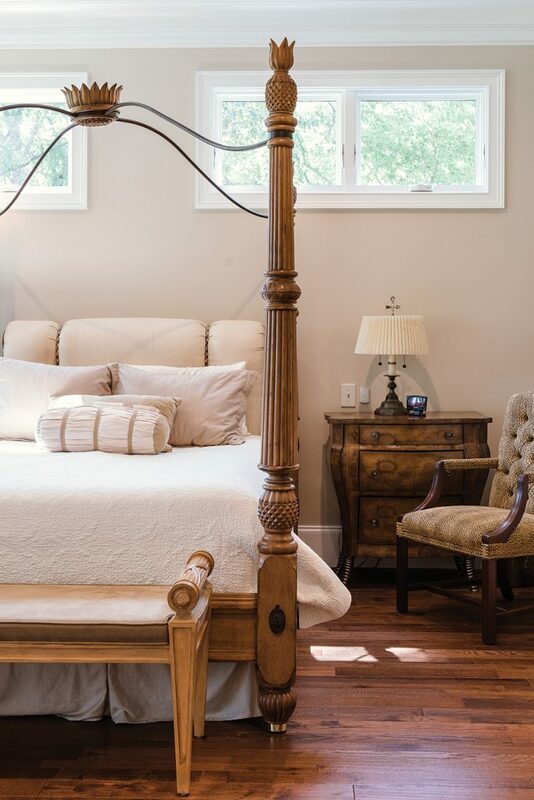 He recessed one wall of the guest room to accommodate a bank of built-in closets and cabinets on the other side, in what would have been a blank wall in a side hallway. Score another point for efficiency, a reflection of Howard’s priorities. 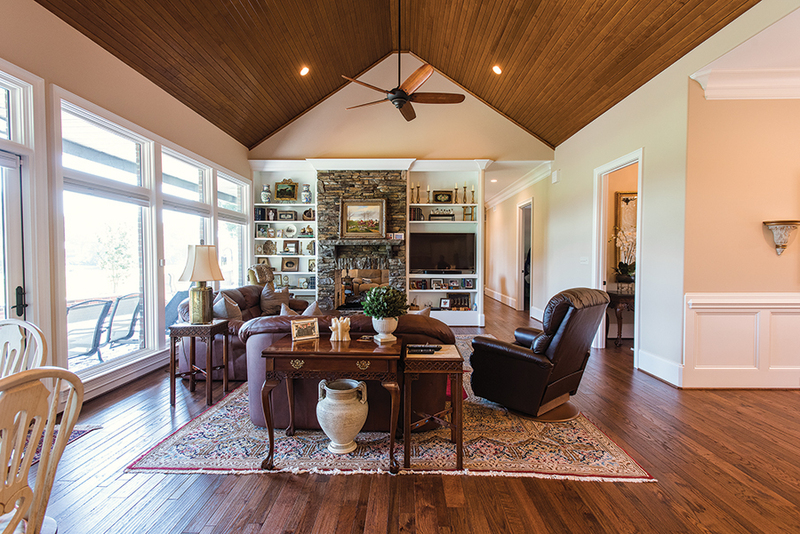 Howard, who took an engineering degree from N.C. State and served in the U.S. Air Force before coming to Greensboro to sell heating and air conditioning systems, knew exactly what he wanted in terms of the home’s technical features. Crews paid close attention to taping seams in the heat shield, especially around outlets and ducts, and to friction-fitting rolls of insulation between the studs. Installers also taped and caulked generously around doublepaned, argon gas-filled doors and windows made by high-end manufacturer Sun. “The windows are more energy efficient than the walls,” says Howard. 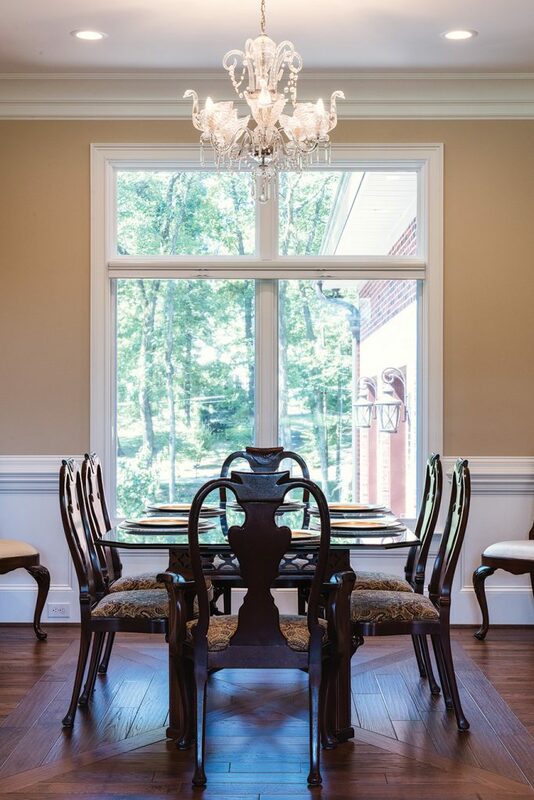 No-mullion glass in every portal provides unobstructed views, and triple locks on the doors mean extra security and tight seals to keep air from leaking in or out. An air lock at the front door — two sets of doors separated by a short foyer — does the same. “The crawl space is encapsulated,” says Howard. “Instead of insulating under the floor, they insulated the walls of the crawl space and put down a vapor barrier on the ground,” he says. His friend Harry Boody at Scientific Environmental Design mapped out a heating and cooling system that filters the air more than most home systems do. “It’s almost hospital-quality air,” says Howard. He estimates that all of the high-tech, energy-sipping features added 20 percent to the price tag of his new home, but it’s el-cheapo to maintain. He also grins at the changing vista behind his home. Spring ushers in birds and blossoms; summer brings a palette of greens, fall paints the landscape with toasty colors; and winter outlines the boughs of a distant evergreen in frost and snow. “It makes a nice Christmas scene,” he says. The home also gives him enough to-dos — up next is an outdoor fireplace — to put some plans on his horizon. Maria Johnson is a contributing editor of O.Henry magazine.